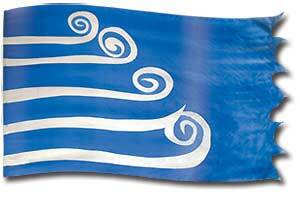 The white spirals of this banner represent the sharp, powerful blasts of God's 'breath' or voice. The breath of our Holy God brings purity, cleansing and sanctification. All this is done on a background of deep blue representing the spiritual or heavenly realm. God's breath operates in the unseen spiritual realm, but causes changes in the physical realm. God's breath transforms things, and brings life - from Adam in the Garden of Eden to Jesus' disciples. His voice, His breath and His Holy Spirit bring life! The LORD, God of Truth, whose breath and Word are Truth, is willing to breathe revelation and inspiration into His anointed servants. God's breath is powerful and creative. In Genesis 2:7 it talks of God breathing life into Adam and in Genesis 6:7 and 7:15 it refers to the breath of life in all living creatures. God's breath gives new life in Ezekiel 37:9. Psalm 33:6 declares that by the word of the Lord the heavens were made, the starry hosts by the breath of His mouth. God's breath can also be powerfully destructive. In 2 Samuel 22:16 David sings of His great power because His breath can lay bare the foundations of earth. In Isaiah 30:27-28, it is compared to a raging flood, in Job 4:9 it states that at the breath of God the wicked men are destroyed; at the blast of His anger they perish. In Isaiah 11:4 He slays the wicked with the breath of His lips. John 20:22 reports that Jesus breathed on His disciples and said; 'Receive the Holy Spirit' and they did! Scripture is described as God-breathed in 2 Timothy 3:16. Breath, Breath of God, Breath of Life, Creative, Destruction, Holy Spirit, Inspired, Life, New Life, Power, Scripture, The LORD God of Truth.